We love art and like to show it on our company t-shirts; consequently they have become so popular we are now offering them for sale - at a very reasonable price. 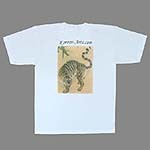 The back features a Tiger and Bamboo painting from the late Chosun Dynasty by Kim Hongdo (b. 1745) and Im Huji (b. 1763) and the front has the "I ART" logo. Tigers play an important role in Korean art and history and symbolize a guardian and charm, and their likenesses, either on a painting on the wall, or on your back on a t-shirt, are thought to act as guardians to the owner. And they look really cool too! Our shirts are made from 30 thread count, heavy weight, 100% cotton, and like all our arts, are made in Korea. See our T-shirts here, and all our New Items here. Inspired in by the historic jewelry of the Shilla and Chosun Dynasties our jewelry has the unique flavor of Korean history yet, with a modern flair and is made of gold, silver, jade, mother of pearl, and other traditional materials. We have fourteen new designs including the Two-tone Starburst Earrings shown at right, and thirteen other designs. As is all our art, our jewelry is designed and created one at a time by hand. And since each piece is made one at a time, we will only carry limited quantities and will make new pieces as they are ordered. So there is a possibility that the jewelry you order may be delayed by a week or so while it is being made. In such cases, we will, naturally, inform you. 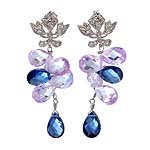 See our new jewelry here and our entire jewelry selection here! Don't miss the chance for big savings on our sale items with discounts of over 25% on our Incised Bamboo Teamug Set and nearly 15% discounts on many of our scrolls like the Min-hwa (Korean folk painting) tiger shown at left. Tigers are traditionally portrayed under a pine tree with a magpie squawking. The tiger is thought of as a messenger for the mountain deities and the magpie a messenger of good news. 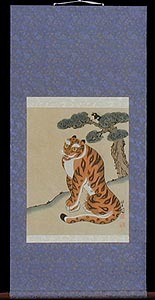 The tiger also represents a guardian and is thought to protect the owner of its image. Other sale items include four other scroll paintings, teamug sets, bowls and vase and bottle sets. See all our sale items here. To celebrate the Lunar New Year, which this year is the year of the rat, we are offering a free t-shirt ($15 value) for every order of $100 or more (total cost including shipping) from February 1 through February 29 2008 (Korea time). To get your t-shirt simply fill out the t-shirt ordering form that will appear after you submit your order of over $100. See details here. 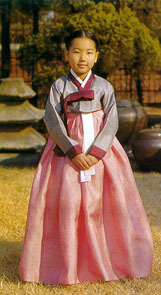 Seol-nal, the Lunar New Year, is arguably the most important holiday in Korea. It's actually a toss up between this and Chuseok, which is the harvest festival and happens in late fall. In any case, they are the two most important holidays. While many Koreans do celebrate the solar New Year, it is more of a one day affair and people tend to do more pure celebratory activities such as meeting friends, going to the center of the city and shooting fireworks at midnight, or climbing a mountain or going to the East coast to see the first sunrise of the New Year. While on Seol-nal many people perform ancestor worship ceremonies or visit family in their hometown. The tradition in fact generally sees a large part of the population travel to their ancestral homes, which frequently are outside of the city of Seoul in the countryside, so there is a mass exodus of people leaving the city the night before, or the first day of the Seol-nal holiday and then for three days families gather, eat Song-pyeon, a type of rice cake which is traditionally eaten on Seol-nal (shown in the photo above), and ddeok-guk, a rice cake soup. The idea of the 'hometown' is somewhat different in Korea than that in the West and so does not necessarily mean the place where one was born but signifies the hometown of one's ancestors or family origin. As soon as the holiday starts and at the earliest possible opportunity, families whose hometown lies away from their current residence travel to their hometowns to meet up with other displaced family members. The number of people that travel are so great during this period, that the roads are choked with traffic for several days at the beginning and ends of the festival, making what is usually a 4 hour trip from Seoul to the southern city of Busan by car a 12 hour marathon. Since Seoul is the economic center of Korea many have moved there for work or study and so the exodus usually is out of Seoul towards the country at the beginning of the festival and back into Seoul near the end of the holiday. Currently about half the population of the country live in the Seoul National Capital Area. This year (2008) Seol-nal falls on Thursday, February 7, and the 6th and the 8th are also holidays. That means many people will travel to their hometowns the night of the 5th, or the morning of the 6th and probably remain there until Saturday or Sunday the 10th and on those days the traffic will be horrendous. Downtown Seoul, on the other hand, will be as quiet as a ghost town (something that doesn't happen very often) with many of the shops closed and a great number of the people gone, or busy in their homes. Upon arrival in their hometowns, families get together and start the festivities. In the days before the actual day of Seol-nal generally the women prepare the foods that will be both eaten and used during the ancestral rites. The difference between the food for Chuseok and Seol-nal is that rice is served on the former and ddeok, rice cakes, in various forms are served on Seol-nal. In the morning family members don traditional Korean clothing Han-bok (shown at right), although this is happening less and less these days and in fact many people don't even have them. Then they perform the ancestor worship ceremony, Cha-rye, which consists of all the foods that were previously prepared, being placed on a table, which serves as an altar, and is in front of a byeong-pung (a large folding screen). 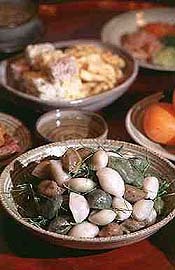 The foods are placed in a predetermined order and must include many foods traditionally used for the ceremony but also include those foods the deceased liked. The idea is to offer plenty of nourishment to the ancestors so they have energy to bless their descendents. The ceremony itself is conducted by the head of the family who is usually the father if he is still relatively lively and is still considered to be running the family, or the eldest son if the father has relinquished control of the family to him due to age. The head of the family lights incense, pours some clear liquor into a glass on the table and then bows twice in front of it thereby commencing the ceremony and signaling the whole family to bow twice. Then the Chuk-mun, which is a list of the ancestors' names, is read aloud. Then one by one, the men in the family (only men participate in this ceremony), usually the father and sons, make offerings of liquor and bow twice after which the foods are offered to the ancestors by placing a spoon in a bowl of rice with the handle pointing to the East while the family prays and lowers their heads. Three spoonfuls of broth are then offered to the ancestors and the ceremony ends with all the members bowing twice. After which, the food is shared and the list of names, the Chuk-mun, is burned. After the ancestor worship ceremony, the younger members of the family bow to the elders in a practice called se-be, which is the first greeting to the elders of the year, and a way for the younger family members to show their respect to the elders, and receive a little money for each bow. At 10-20,000 won (about $10-$20) per bow a child can get up to a few hundred thousand won ($200) if there is a big family during the se-be ritual and this, naturally, makes them quite happy. Activities during the Seol-nal holidays used to include a lot of kite flying, playing a traditional Korean game called Yut, or playing with tops, but nowadays there seems to be much more computer game playing than anything else. 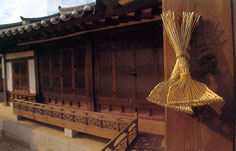 Another tradition from the past that is fading is the Bok-jo-ri which is a traditional tool used for separating rice from small stones or straw. In the past Bok-jo-ri vendors would travel around villages early Seol-nal morning yelling "buy Bok-jo-ri". When the vendor was heard he would be called into the house and the house owner then buys a Bok-jo-ri and this signifies the collecting of fortune throughout the day and the rest of the year. This means literally, "Receive a lot of fortune!" and is the greeting used by everyone for at least three to four weeks after Seol-nal upon first seeing a friend or acquaintance. So be sure to learn it and say it to all your Korean friends!